Take a trip to the forest with this week's new woodland designs. 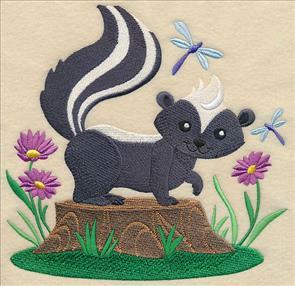 All new machine embroidery designs feature the beauty and wonder of the woods -- and all its wildlife! 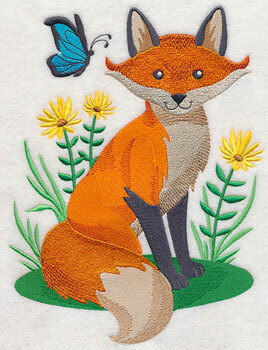 Adorable woodland friends play alongside butterflies and dragonflies, elegant forest foliage and flowers create stunning displays, and wild and woodsy scenes await in this new collection of embroidery designs. 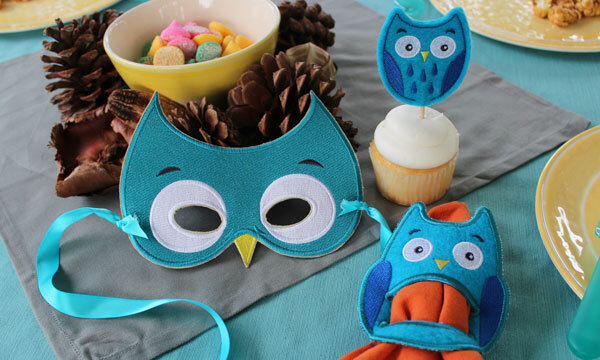 Days of the week woodland cameos are terrific on tea towels, and new in-the-hoop masks, napkin holders, and cupcake toppers are the perfect way to throw a woodland-theme party. Try these designs as fabulous additions to tote bags, pillows, home decor, and more! 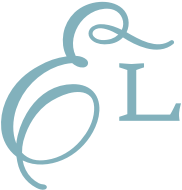 Scroll down to see these gorgeous designs! 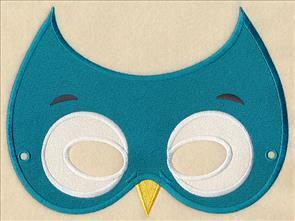 Throw a party your little ones will love with adorable stitch-filled masks! 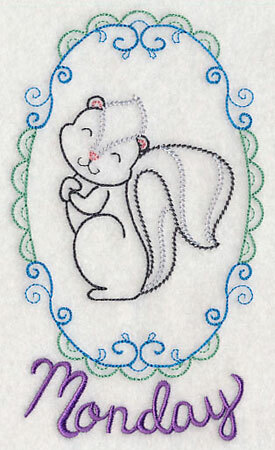 Sweet woodland friends are a fabulous addition to embroidery projects of all shapes and sizes. 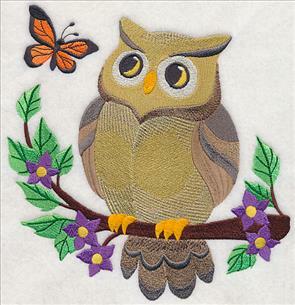 Add a friendly fox to tote bags, pillows, and wall hangings; a whimsical owl is terrific on aprons, kids' decor, and quilts. 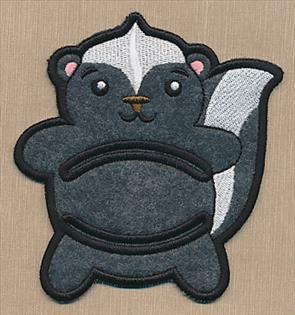 7.77" x 7.81" and 6.85" x 6.88"
5.83" x 5.86" and 4.84" x 4.86"
A too-cute skunk and an adorable raccoon frolic alongside dragonflies and flowers in the forest. 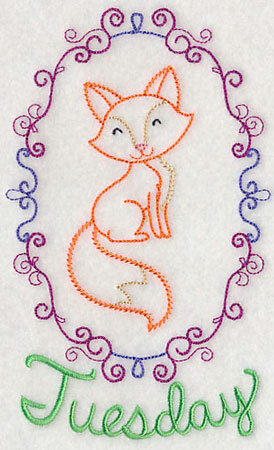 Stitch the wildlife animals as a group of four, or pick your favorite to add to an embroidery project. 7.81" x 7.67" and 7.03" x 6.90"
7.25" x 7.80" and 6.51" x 7.00"
5.86" x 6.30" and 4.82" x 5.19"
Beautiful woodland flowers, pinecones, greenery, and more make a beautiful bouquet in this machine embroidery design. 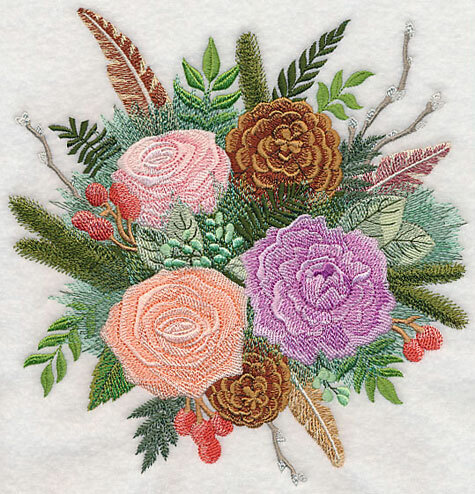 The muted color scheme and variations of stitches give this vibrant floral motif incredible layers of depth and texture. 7.34" x 7.80" and 6.90" x 7.37" and 5.87" x 6.24" and 4.86" x 5.17"
A stunning spray featuring the brilliant wildlife blooms is a great addition to pillows, quilts, wall hangings, and more. 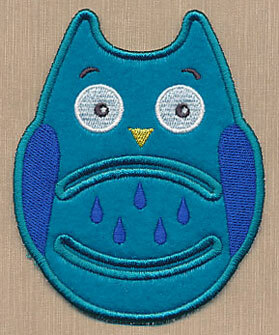 Pair it with the other woodland meadows designs, or stitch it alone. 11.74" x 5.30" and 9.40" x 4.24" and 7.80" x 3.52" and 6.85" x 3.08"
This woodland foliage border is a fabulous accompaniment to the other floral designs above. 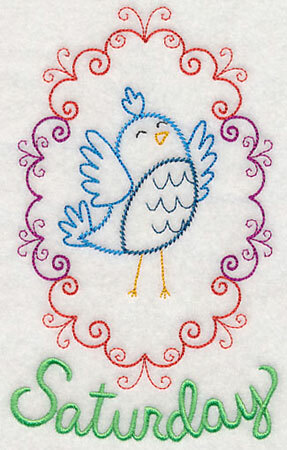 Stitch on placemats, quilt borders, linen sets, and more. 11.74" x 5.03" and 9.40" x 4.02" and 7.79" x 3.33" and 6.00" x 2.77"
Highlight a pocket, napkin, or placemat with a gorgeous woodland corner design. 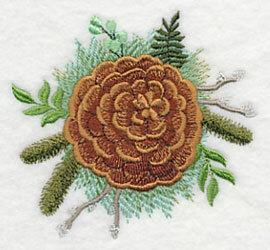 The pinecone, flower, greenery, and feather arrangement adds a natural element to your embroidery. 5.85" x 5.81" and 4.85" x 4.81" and 3.85" x 3.82"
Finish your woodland meadows series with a pair of single pinecone and flower designs. 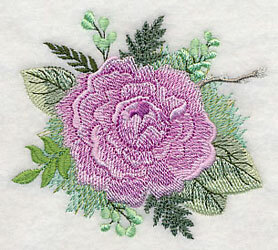 Stitch them alone as focal points on apparel, as embellishments on towels, or use them on a quilt. This beautiful collection of woodland designs can be purchased singly by using the links above, or together in a design pack. 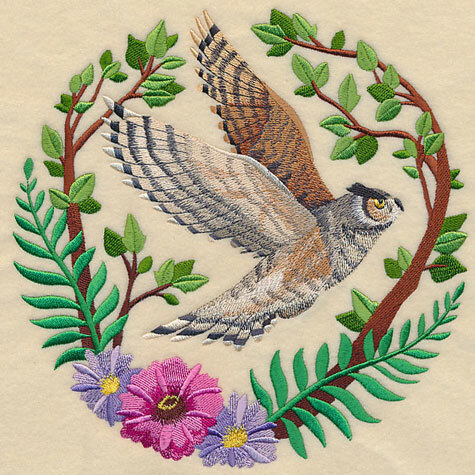 A majestic owl soars through the sky in this embroidery design. 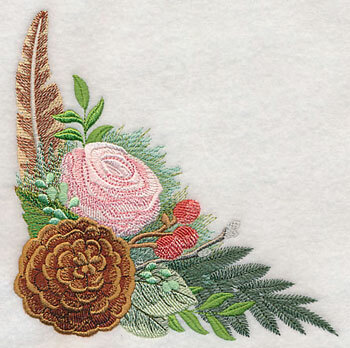 The beautiful bird is surrounded by traditional woodland foliage and beautiful blooming flowers. Terrific on totes, framed pieces, and more. 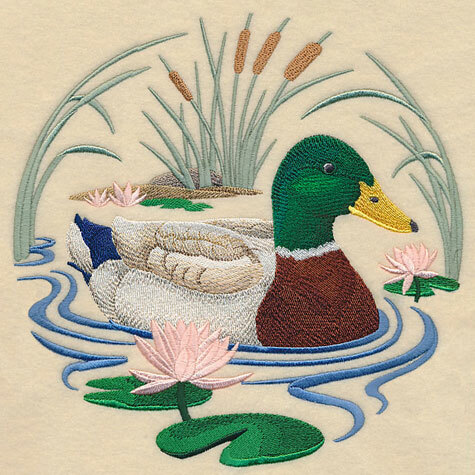 8.60" x 8.58" and 7.78" x 7.78" and 6.88" x 6.88" and 5.87" x 5.86" and 4.86" x 4.86"
A woodland duck relaxes around traditional greenery in this machine embroidery design. The serene scene is a terrific addition to tote bags, pillows, wall hangings, and quilts. 8.61" x 8.63" and 7.76" x 7.78" and 6.89" x 6.91" and 5.79" x 5.81" and 4.87" x 4.89"
Quick-stitch days of the week designs are a fabulous way to update your kitchen decor in no time. 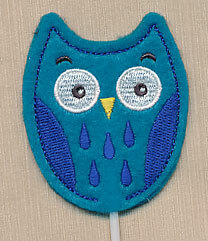 These vintage-style woodland cameos are a super adorable way to add color and flair to tea towels. Plus, the text is a separate color stop, so you can easily omit it and add accompanying embroidery to aprons, napkins, and placemats. 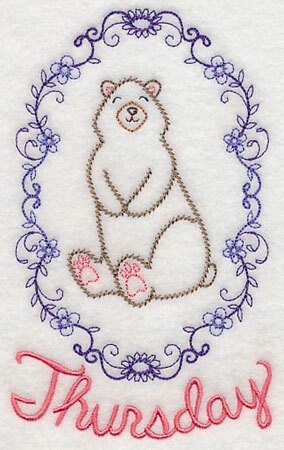 4.02" x 6.89" and 2.26" x 3.86"
Each of the new days of the week designs features a sweet woodland animal encased by a light-stitching cameo frame. The bright colors and whimsical appearance in these designs make them a great way to spice up your decor. 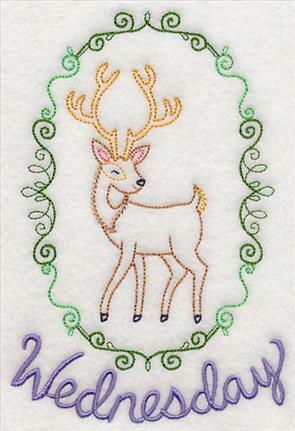 4.62" x 6.89" and 2.59" x 3.86"
Because vintage-style designs are best on smooth, neutral fabrics, these woodland cameos are the perfect addition to tea or floursack towels. Find good quality towels at Target, Home Goods, Kohl's, and TJ Maxx. 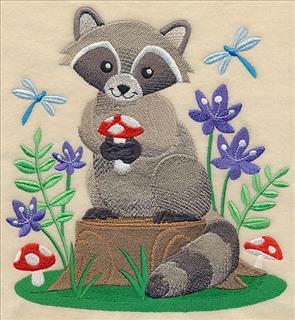 4.00" x 6.90" and 2.24" x 3.86"
A raccoon, skunk, fox, deer, bear, owl, and bluebird are terrific additions to any kitchen or dining room decor. 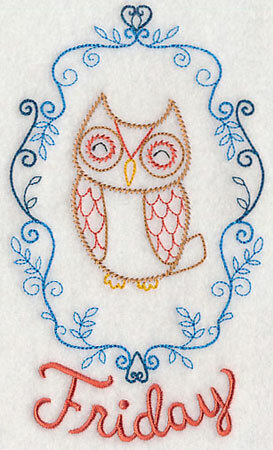 Try them on your next set of tea towels! 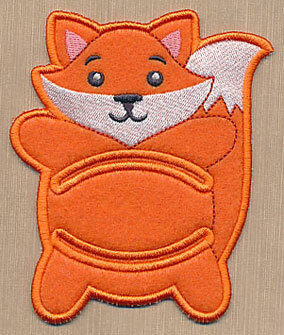 4.25" x 6.90" and 2.38" x 3.85"
Add adorable woodland animals to a brand new tea towel set for a pop of color and fun. Get the whole set of designs in a design pack. 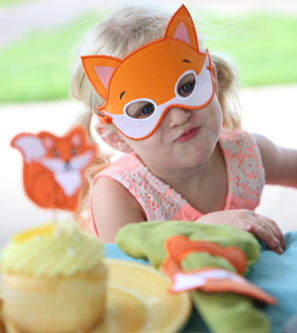 Make your next party a standout affair with embroidered animal masks! 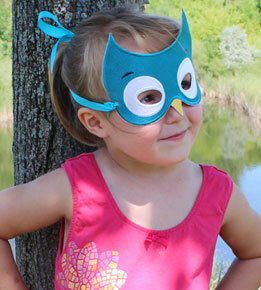 Choose your favorite animal (owl, raccoon, fox, or skunk) and use these mask designs to transform you and your loved ones into fabulous furry friends. Each mask comes in two styles -- stitch-filled and in-the-hoop -- and are terrific for Halloween, costume parties, birthdays, and more. 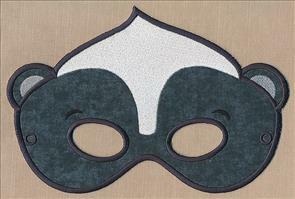 Plus, each of the brilliant masks come in three different sizes: large, medium, and small. Simply pick your favorite animal, style, and size to get started! 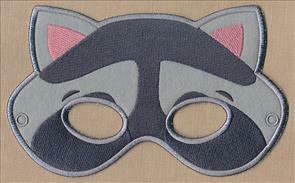 Project instructions demonstrate how to make these embroidered masks, as well as information on sizing. Click here to learn how to make a stitch-filled wearable mask, and here to make one in the hoop. 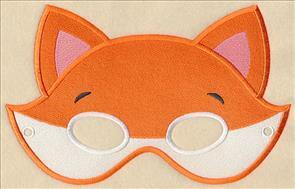 This brilliant in-the-hoop fox mask is an adorable addition to your next party. 8.60" x 6.40" and 7.46" x 5.56" and 6.52" x 4.86"
8.40" x 5.16" and 7.30" x 4.49" and 6.38" x 3.92"
9.04" x 5.77" and 7.85" x 5.01" and 6.86" x 4.38"
8.97" x 6.00" and 7.79" x 5.21" and 6.81" x 4.56"
Too-cute wild and woodsy napkin holders add a kick of style to your party table! 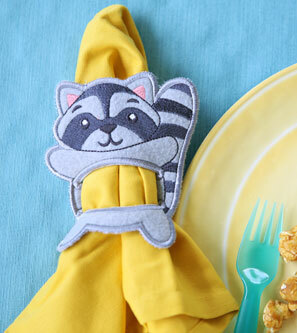 These in-the-hoop napkin holders are ready to help you get the party started. 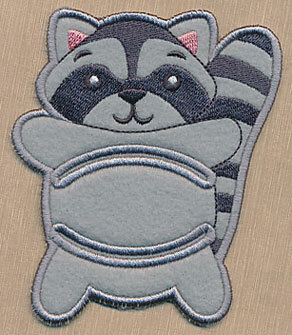 Holders come in the shape of four different woodland animals: an owl, raccoon, fox, or skunk. 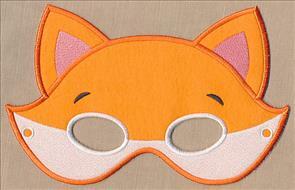 And, each one is available in two different sizes, too! Project instructions demonstrate how to make these in-the-hoop napkin holders, as well as information on napkin sizing. Click here for more details. 4.01" x 4.66" and 3.35" x 3.89"
4.37" x 4.65" and 3.65" x 3.89"
Sweeten up your cupcake decorating with a cute-as-a-button woodland topper. 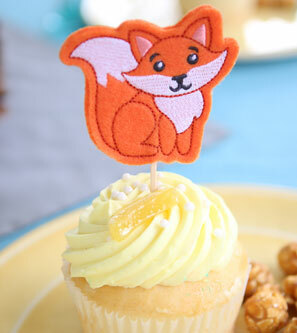 These in-the-hoop designs are an easy embroidered way to add fun and flair to plain-Jane cupcakes. 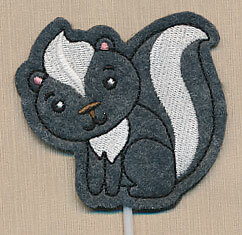 Plus, the woodland animals are great as pencil toppers, too! 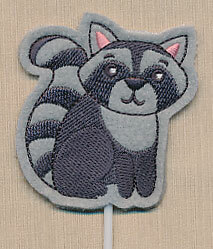 Each of the toppers feature one of four animals (owl, raccoon, fox, or skunk) and are stitched entirely in the hoop. 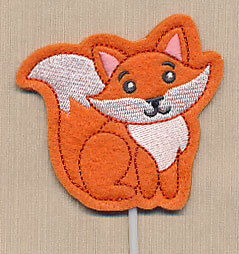 Simply add a skewer, lollipop stick, toothpick, or sandwich pick, and you're ready to go! 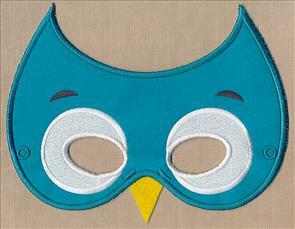 Click here for project instructions for making these in-the-hoop toppers. 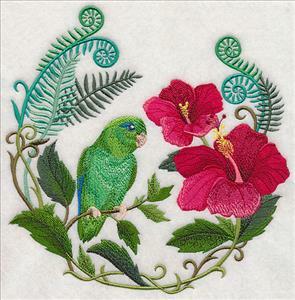 Sandi has been searching for embroidery designs featuring vibrant parrotlets, and requested a couple new ones to add to her collection. 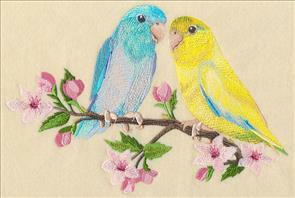 We were happy to digitize a pair of designs featuring the tiny parrots -- thanks for the suggestion, Sandi! 7.77" x 7.80" and 6.89" x 6.91"
10.34" x 6.89" and 8.80" x 5.86"
7.79" x 5.19" and 6.86" x 4.57"